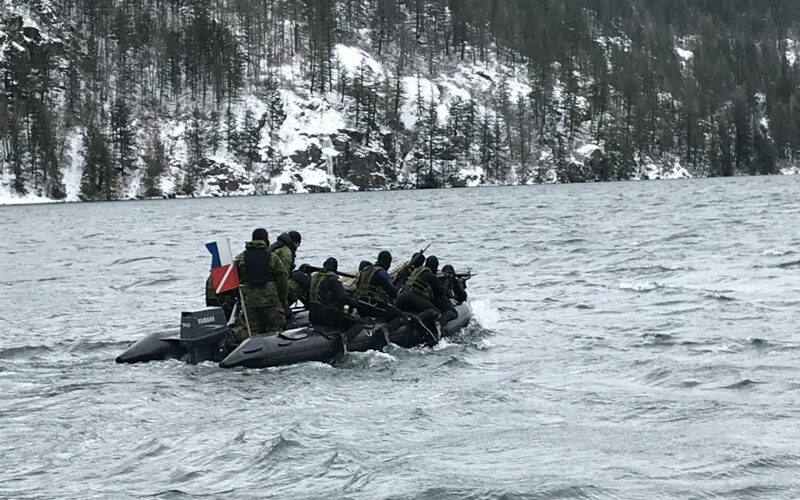 This past February, combat divers from all four Canadian Combat Dive Teams deployed to Cultus Lake, BC, where they met with divers from Germany, Holland, the UK, and the US to participate in a training event that has been running since 1979. Exercise Roguish Buoy is an annual exercise conducted by the Canadian Forces School of Military Engineering’s (CFSME) Army Dive Centre to progressively train and prepare Army combat divers, and participating allied forces, for the rigorous challenges they can face in our evolving security environment. Exercise Roguish Buoy provides an opportunity for the Army’s combat divers to receive focused continuation dive-training to build on skills developed at the CFSME and the various engineer regiments, while also serving as a venue to evaluate interoperability of tactics, techniques and procedures with our allied military partners. Exercise Roguish Buoy operates on a three-year training cycle alternating between underwater construction and demolition, ice diving, and close support engineering. As this year’s emphasis was on close support engineering, tasks included tactical insertion and extraction techniques for combat dive teams, minefield emplacement and breaching, and gap-crossing reconnaissance. As part of the Army’s commitment to operational effectiveness, Exercise Roguish Buoy employs realistic, challenging, and adaptive training to enable success in an ever-changing security environment, regardless of condition. These rigorous training conditions are essential to meet the highly technical requirements of modern militaries such as the Canadian Armed Forces. Despite the driving snow and below-freezing temperatures, teams were at peak performance both on and off the water. Canadian divers and their international partners worked side-by-side in fully integrated teams, and accomplished their assigned tasks through the sharing of best practices from each country’s doctrine.